Thank you again to beranekp@Flickr for contributing one of his photographs to BPotD (original image | Botany Photo of the Day Flickr Pool). Perhaps like me, you’ll also find this photograph provoking some needed cheer. Scorzonera is a genus of about 175 species, distributed throughout the Mediterranean region and into central Asia. One member of the genus is cultivated for food production, Scorzonera hispanica, or Spanish salsify / black salsify (though not a true salsify). 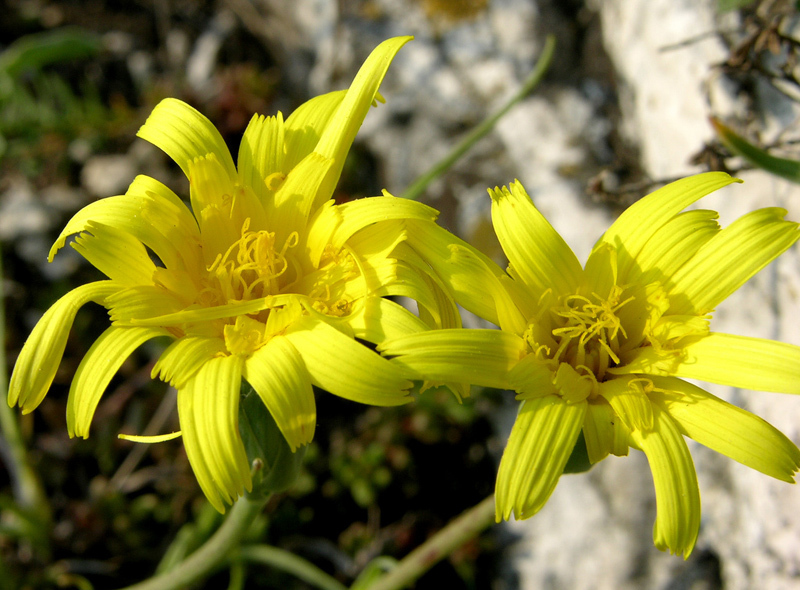 Twenty-eight species are native to Europe, including the species featured in today’s photograph, Scorzonera austriaca. Austrian vipergrass (though, again, it is not a grass), is distributed across Europe, from France east to Asian countries bordering Europe. This perennial species reaches 40cm in height, and grows in well-draining sites (dry pastures, stony places, etc.). Flowering heads are borne individually on unbranched stems. For additional photographs, see Scorzonera austriaca on botany.cz or via Calphotos (including a photo of a plant in fruit): Scorzonera austriaca. What a relief to snow, snow, snow! If these flowers are anything like those of Scorzonera hispanica they won’t just look cheerful they will offer a cheering scent as well. Much is made of Cosmos astrosanguineus, but for the scent of chocolate, black salsify flowers are even better. Thanks for this sunny photo- and for the Red List link from which I learn, too. Here is a link I found for cooking Scorzonera- I was looking for a photo of the Salsify I grow, which is about 3′ tall and has a purple flower. The seedhead is like a Dandelion blow on steroids- very symmetrical and sturdy enough to use in dried arrangements if sprayed with hairspray. In Sweden the blackroot is also called “poor man’s asparagus”. Peel it, put in i slightly acidic water and gently simmer. Serve with a buttersauce. I would describe the color as something between neon yellow and super chartreuse. Whatever it is, it holds your eye.